ASSISTANT GRADE-III (GENERAL / ACCOUNTS / TECHNICAL / DEPOT). FCI Recruitment 2019 for 4103 various job profiles all over India. FCI (Food Corporation of India), is one of the largest Public Sector Undertakings under Government of India guaranteeing the food safety of the Nation. Food corporation India Recruitment department invites online application for the under mentioned posts in its Depots and Offices spread all over India. Well qualified and eligible contenders who fulfill the prescribed qualifications, age, experience etc. 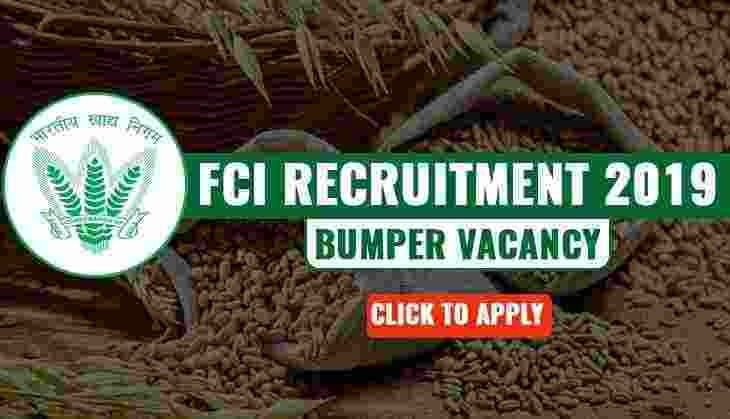 criteria can apply for these FCI Jobs 2019. If an applicant is appealing a particular qualification as equivalent qualification as per the requirement of the Notice of examination, wherever applicable, order/ letter in respect of equivalent Educational Qualifications, will required to be produced by the contenders at the time of Document Verification and as and when required by FCI, indicating the Authority (with number and date) under which it has been so treated, in respect of equivalent clause in Essential Qualifications. The decision of FCI shall be final and binding in this regard. The only mode of application is ONLINE for applying this process of FCI Recruitment 2019. Food Corporation recruitment department will not accept the printed/ hard copies of the application form. Relevant experience should be after acquiring minimum required qualification for the relevant post. 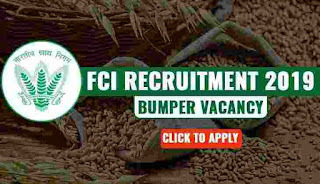 Check out the complete post carefully before applying for this FCI Recruitment 2019. Applicants having a Graduation degree in Computer Science/ Computer Application with typing speed of 40 w.p.m. and Shorthand speed 80 w.p.m. Graduation Degree with Hindi as the main subject & 1 year experience of translation from English to Hindi and vice-versa. Graduation degree in any stream with 30 W.P.M speed in Hindi Typing speed. Graduation degree holder with proficiency in the use of computers. Graduate under Commerce stream with proficiency in the use of computers. B. Tech / BE in Food Science / Food Science and Technology / Agricultural Engineering / Bio-Technology. Having a Graduation degree with proficiency in the use of computers. What is the Application fee for Applying this FCI Recruitment 2019? 1). For General /OBC: Rs.500 will be the application fee. 2). For SC/ST.PWD/Women candidates: RS.0 will be the application fee. Paying Method: Applicants have to pay the application fee through the online mode only. The various method which you can use for online payment of the application fee are: “ Credits Card/Debit card/Net Banking”. 28TH Feb. 2019 is the Start Date to Apply.